Arrival partners at the railwaystation in Kortrijk: France at 13:45, Uk at 15:43, Germany at 19:16. Welcome and follow up by Johan. 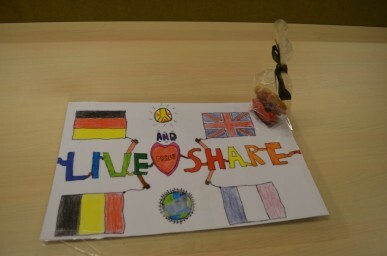 Partners from France will be invited in St.-Paulusschool for the exhibition presented by the 5th class. Meeting and greeting in class 6 till 16:00. Bus or Johan and teachers will bring France and UK with the car or bus to the hostel Groeninghe (Passionistenlaan 1, 8500 Kortrijk•003256 98 06 92). UK will be welcome by Johan + Herwig or teacher and we bring you to the hostel. Germany will be welcome by Johan, Jan en Hilde. Luggage will be brought to the hostel by car. 19:15 All visitors will be carried with the car to the restaurant ‘COLMAR’ for a supper. After supper visitors all back to the hostel. 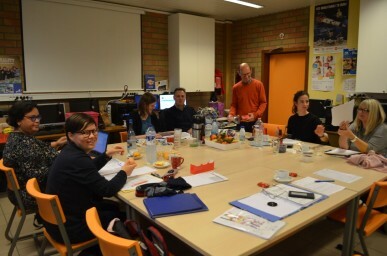 Breakfast in Hostel Groeninghe. Start activity city walk at the Hostel at 9:00. Making groups + Johan explains how to work with the ipads, maps.me and shares the maps, ipads and shows how to handle the quiz on the ipads, making a video and photo. City walk and quiz with ipads in groups of 2 x 4 children + 3 x 5 children guided by the teachers. 2 UK + 2 DE / 3 FR + 2 DE / 2 UK + 3 FR / 3 FR + 2 DE / 2 UK + 2 DE. Back at school at 11:40. Dinner at 12:00 at St.-Paulusschool in the PC- classroom for teachers. Children in the lunchroom. 13:10 till 14:50 Art workshops in class 4, 5 and 6. Same groups as in the morning except 3 Children of France together. Workshops leaded by each teacher of the class. Same time meeting with all partners in the PC-classroom. Necessary documents and agreements upon dates next visit to France? UK? Or Germany? Date Course Restorative Practices? Guided tour Classrooms St.-Paulus. Reservation picknick Friday. Free evening started at 16:00. Shopping in Kortrijk, free time in hotel, film, … Suggestions for extra activity if needed can be asked to Johan. Pizza ordered and delivered in hostel. Icerink Boudewijnpark scating from 14:00 till 15:15. Don’t forget the gloves! Train at 17:15 platform 7 arrival Kortrijk 18:05. Walk back to Hostel 15’. Dinner at 18:30 in hostel, spaghetti. Breakfast Hostel, ask for picknick and collect in handbag! Pickup at 8:15 by bus at Hostel. 17:00 Bus to OC Rookop in Reningelst (Heuvellandseweg 1a 8970 Reningelst) arrival 17:15 for supper with chef Dirk (ex-teacher St.-Paulus) typical Flemish food and drinks with teachers from St.-Paulus and invited guests. Return to Kortrijk at about 20:30 arrival in Ibis Hotel Kortrijk for all children/partners UK, France and Germany at 21:00 and in St.-Paulus for children Belgium 21:15. Children Belgium joins the parents. Breakfast in Ibis hotel for all partners. Farewell to France partners in railwaystation. Train at 8:38 for France. Children UK leaves Kortrijk and ibishotel by walking at 11:30.